For the last three months I’ve been ready to start hiking 14ers, but between weather and work, my plans were delayed. When I found out I had a mid-week, day off, and so did Andrew, we started planning. Having very little time to get out hiking lately, I decided I should do a short one and see how my knees do. I’ve had knee problems since high school and it’s held me back from doing the amount of 14ers I’d like to be doing. Unfortunately, I realized that I’m nearly out of “short” 14ers. I could have done a repeat, but I wanted to hike a new one. 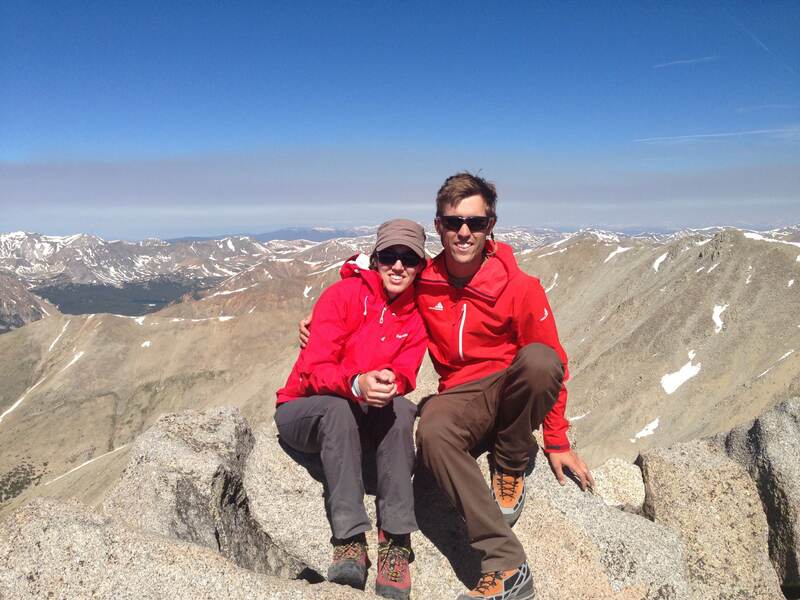 Our search for a less than 10 mile hikes, took us to the Sawatch range. The Sawatch range is only three hours away so it was an acceptable distance. Andrew found Mt. Shavano, more specifically, Andrew found the Angel of Shavano (a snow climb) that was around 7 miles. I’m new to snow climbing, so I was excited and a little nervous. Andrew assured me that it was low angle and a good one to learn on. After a busy start to the week, our final decision to climb Shavano was made late in the evening on Tuesday. We packed our bags, got a short nights sleep and headed to the mountain around 2 a.m.
We started hiking around 5:30 a.m. The Standard route up Shavano (and Tabeguache Peak, if you choose to include it) is pretty straight forward. 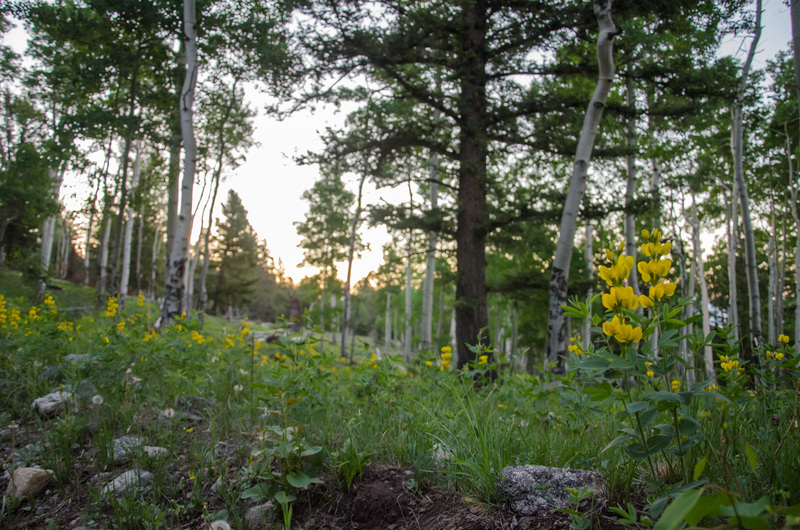 We followed the Colorado trail, a short distance, until we saw signs for Shavano. We followed the well-marked standard trail to 11,200′. From there, we set off along a drainage away from the main trail. With little information we quickly found out that the trail to the Angel was non-existent and not very popular in recent years. It looked like the entire forest had fallen over and it took us about an hour to bushwhack over and under all the pine trees. (I think I’ll mention that I ripped my brand new R1 and almost cried.) We quickly decided that even though the glissade would be fun and easier, we’d take the standard trail back out instead of dealing with the down trees again. The snow climb was a great learning experience. While I had practiced self arresting and quickly glissaded in the past, I didn’t feel comfortable jumping straight in to the climb. Andrew gave me some quick tips and reminded me of the basic skills I needed as we started up the snow. The snow was soft enough to kick toe steps in and crampons were not necessary (although it would have made the climb faster). I slipped a few times, but it wasn’t steep enough to make much difference. By the end, I was having fun! During the climb, I thought about Castle and Conundrum, which I’ve eyed for a couple of years and hope to try in the near future. We left the Angel (one of her wings had melted out) and headed back to the standard trail. Both routes have about 4,600′ of elevation gain and so it felt fairly steep the entire way. Once we gained the ridge, we headed towards a false summit and a steep trail to the top. The real summit isn’t visible until you’re basically on it, which is frustrating for me, because seeing the summit always gives me more motivation. The summit had half a boy scott troop on it and took some navigating around exhausted, nearly unconscious kids to find a seat. Not far away we could see Tabeguache and though I desperately wanted to keep going and knock two 14ers off my list, I knew better than to keep pushing it. We enjoyed our lunch at the summit. The sky was cloudless, except for a smokey haze from the Colorado fires and after about 10 minutes we started down. The main trail, which is 9.25 miles round trip felt like it took forever (or maybe I’m just impatient). My legs and knees felt pretty good until the last two miles. The downhill always gets me! By the last mile, my knees were hurting so bad, I had to go extremely slow. I have high hopes that some knee strengthening exercises and more hikes will get me in shape for some longer 14ers this summer. All in all, Shavano was fun. It’s unfortunate that so many trees are down, because the Angel is a ton of fun. At this point (unless we were missing something) it would be nearly impossible to get skis through that valley. 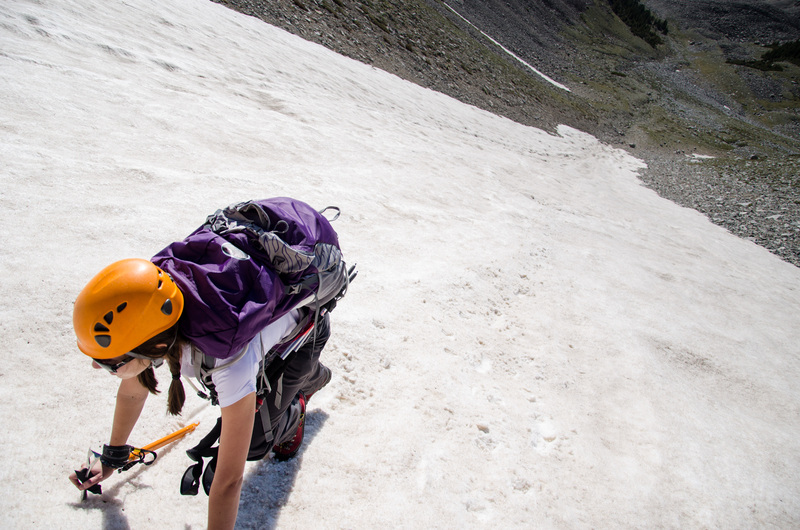 I’m looking forward to including more snow climbs in the future and hiking more 14ers this summer! This was my first snow climb as well! I enjoyed it. Luckily, I did it before the wind storm blew all those trees down. I definitely feel you on how the nature of that trail beats you up on the way down. I’ve hiked this one twice, but it seemed like the last one really left me worn out. Great job on the climb!